Using NOEMA and the IRAM 30-m telescope, an international team of astronomers from different laboratories, including the Institut d'Astrophysique Spatiale (IAS-Université Paris-Sud/CNRS), the Laboratoire d’astrophysique de Marseille (Aix-Marseille Université/CNRS) and the Astrophysics Department of CEA-IRfu, just witnessed how the sites of the most intense star formation in the early Universe communicate with their surroundings through rapid gas exchange. Their findings offer unprecedented insights into the most rapid evolutionary phase of massive galaxies, about 11 billion years ago. The results are published in two diferent papers in Astronomy & Astrophysics on 2018 November, 30. The most massive galaxies experienced their most rapid period of growth when the Universe was only about 20% of its current age. Immense amounts of dust and gas gave rise to veritable fireworks of star formation, which have no peer in the Universe today. Most of these stars formed in giant, gaseous clumps, which were as massive as small galaxies today, but formed stars at rates that were a hundred times greater than those in the entire Milky Way. The relationship of these clumps with their surrounding host galaxies has so far been largely unexplored. The combined capabilities of the two IRAM facilities (NOEMA and the IRAM 30-m telescope) have now enabled researchers to witness for the first time that these clumps do not form their stars in isolation, but must be in constant gas exchange with their surroundings: “This is the first time that we have seen the direct signatures of molecular gas being lifted off one of these clumps, giving rise to a wind, which can remove most of the mass of this clump within only a few million years”, says Cañameras, lead author of the new study, who started this work as part of his PhD thesis at the Institut d'Astrophysique Spatiale (IAS, CNRS and Univ. Paris-Sud) in Orsay near Paris. “We discovered this wind as a subtle spectral feature in a bright emission line of carbon monoxide from a galaxy about 3 billion years after the Big Bang, which was previously unknown, and which we nicknamed ‘the Emerald’.” Carbon monoxide (CO) is the most commonly used tracer of molecular gas throughout the Cosmos. 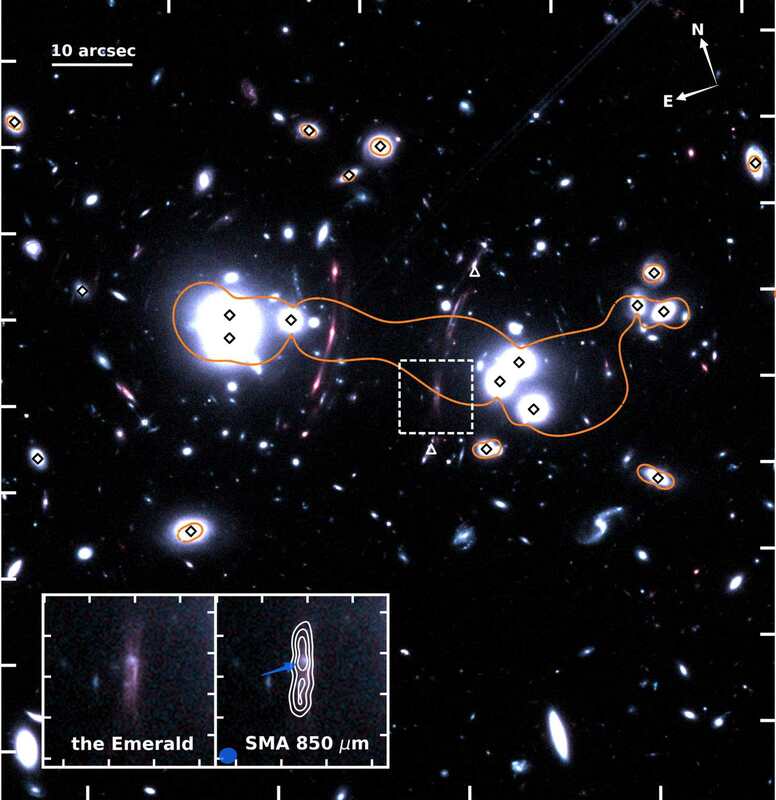 Due to the fortuitous position of a cluster of galaxies between the Emerald and the Earth, which acts like a magnifying glass, the team was able to study star formation on scales of a few hundred light years, which are otherwise only accessible within the most nearby galaxies. The overall image shows the galaxy cluster located between the observer on Earth and the Emerald galaxy (marked by the central doted square). This massive cluster acts as a strong gravitational lens, distorting and magnifying the Emerald and other background galaxies, and allowing astronomers to study their internal properties in great detail. In the lower inset, different views of the Emerald as it was about 11 billion years ago, are dispayed, showing the stellar (left inset), dust (middle inset) and molecular gas (right inset) emissions. The blue arrow shows the host of the molecular wind arising from an intensely star-forming clump, and detected with the IRAM interferometer. Star-forming regions strongly evolve in galaxies. The team also probed the emission from this intra-clump gas directly in the Emerald and a few other, similar galaxies, by observing several emission lines of CO with EMIR on the IRAM 30-m telescope in order to study the physical properties within molecular clouds. “These lines require different energies to be excited, and so by measuring their relative brightness, we can probe the density and temperature within the clouds, and also the intensity of the radiation produced by young, recently formed stars”, comments Chentao Yang from ESO, co-author of this study. “We need to detect a large number of emission lines with different excitation energies to understand if these very distant galaxies host single or multiple gas phases”. 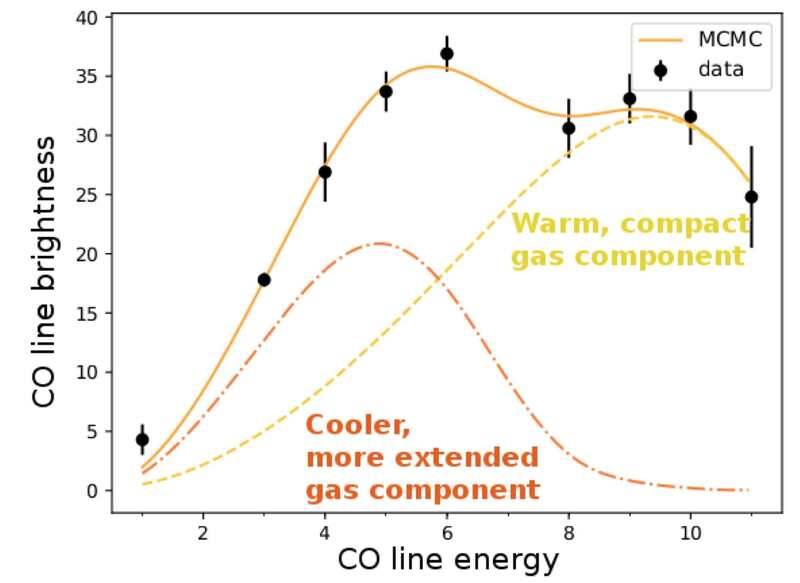 Brightness of the carbon monoxide emission lines detected with EMIR on the IRAM 30-m telescope as a function of the line energy levels, for a distant star-forming galaxy with clear evidence for multiple molecular gas phases with different properties. The warmer and more compact gas component is directly fueling the star formation, probably within massive clumps.